Oh how I love fall. Hoodies, bonfires, boots, hay rack rides, flannels, and football games. I’m one happy camper when I have a cup of cider in my hand, and pumpkin faces are lit up on my porch. Does fall make you happy too? Another thing I love about fall is the romance that is in the air. Something about the leaves changing and the crisp air makes my heart tingle. 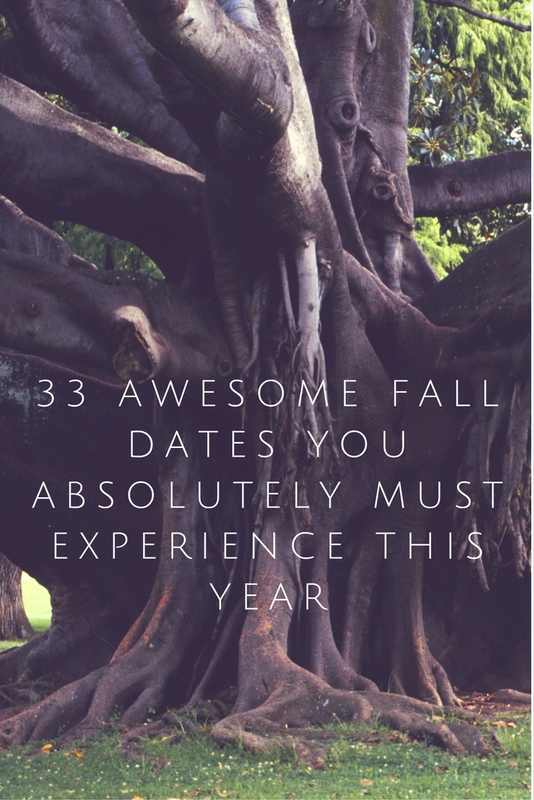 Here are 33 Awesome Fall Dates You Absolutely Must Experience This Year to soak up that romantic feeling that’s abuzz. Make a Fall Bucket List together. Head to the local orchard and pick apples. Hit the pumpkin patch for the best gourd. Get scared at haunted houses. Carve pumpkins for the porch. Make caramel apples and watch a movie. Head on hike and enjoy apple cider afterwards. Take in a hay rack ride and bonfire. Drive around looking at leaves and sipping hot chocolate. Spend the day at a fall festival. Lay out blankets and gaze at the stars. Invite friends over for a costume party. Make fancy gingerbread houses together. Grab a hoodie and take a bike ride around town. Make a s’mores buffet and light a fire. Hitch up the camper or pitch a tent for some fall camping. Stock up on kettlecorn for a fall movie marathon. Create your own brew tour with stops at local pubs. Create your own coffee tour with stops at local coffee shops. Head to the park and fly kites. Head to a chili cook-off in the area. Take in a hot air balloon ride and enjoy the beautiful colors below you. Plan a fall photo shoot with your spouse or significant other. Go on a ghost hunt at local haunted stops. Cheer each other on at a fall race or fun run. Hello zombies! Bundle up for your high school’s homecoming football game. Head to a tailgate or host one of your own. Pack a basket for a yummy fall picnic. Plan a backyard movie night or hit the local drive-in. Rake up leaves and jump in them like little kids. Enjoy the music at an outdoor concert. Enjoy a fun scavenger hunt. Visit the zoo and see what the animals are up too. Serve meals at the local shelter. Deliver winter care packages to the homeless. Relax on the couch with Halloween Movies on repeat. What are some of your favorite fall date ideas? PIN 33 Awesome Fall Dates You Absolutely Must Experience This Year for later! I love this list! I think it is so important to keep dating your spouse after you are married. Sometimes it is difficult to make time, but definitely needed to keep a marriage strong in my opinion! Thank you for sharing! You’re welcome and I agree – it is difficult to make time, but I can definitely feel a strain between us when we don’t make that time. When we focus on even one night a month for just us, it makes the world of difference!